The statistic presents the monthly exchange rate of U.S. dollar to Russian Ruble from February 2017 to February 2019. 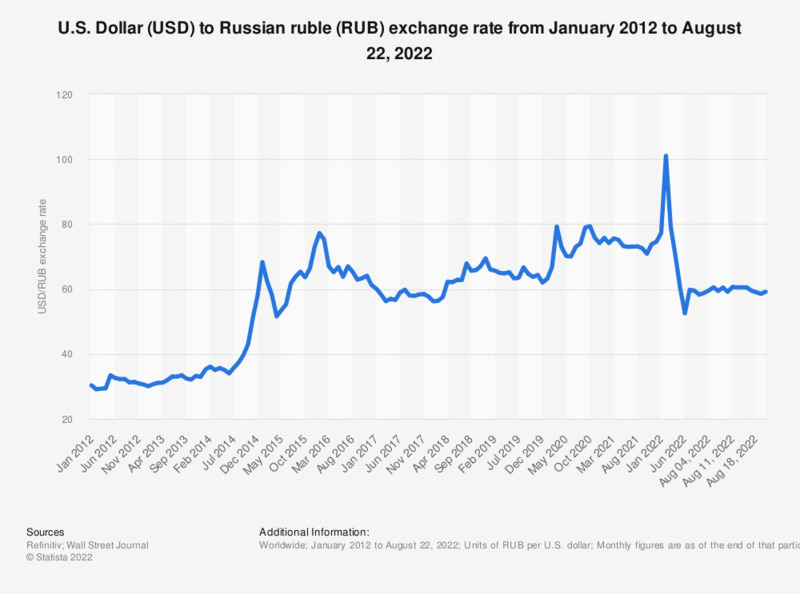 The USD RUB exchange rate amounted to approximately 65.73 on February 28, 2019, which means that one U.S. dollar could buy approximately 65.73 Russian Rubles on that day. A currency exchange rate expresses how much a given currency is worth in another currency. Every country has its own currency, which is used locally as a means of payment for goods and services. An exception is the euro zone, a coalition of European countries, where the euro is the common currency used. The euro was first introduced on the financial markets on January 1st, 1999 and it replaced the domestic currencies of the eleven countries which initially participated in the creation of the euro zone. Maintaining the stability of a currency is one of the most relevant tasks of a government. Significant fluctuations of a currency can deteriorate the value of international trade, capital flows, interest rates, business revenues (if part of the company operations are carried out abroad), foreign-currency mortgages or returns and investments. One of the most common ways of measuring the change in the value of currency is comparing its purchase parity in different time periods. The indicator used for this purpose is called the Consumer Price Index (CPI), which reflects the price of goods and services in a household. If, within one year, the price of the goods and services basket changes from 1,000 U.S. dollars to 1,050 U.S. dollars, it means that the inflation rate was equal to five percent and that the purchase power of the U.S. dollar decreased during this period.